Of all the factors that go into a great recorded guitar sound, the loudspeaker is the least well understood — but the right speaker can make all the difference. When we talk about recording the electric guitar, we tend to focus first on things like mic selection, mic placement and how to position the guitar amp in the room, all crucially important parameters when it comes to capturing the sound we want. On the other side of the glass, meanwhile, guitarists have their own priorities. As the only group of people on the planet who can rival recording engineers for obsessing about their equipment, they will tweak and tinker with the settings on their amp, effects pedals and guitar in search of the perfect tone. 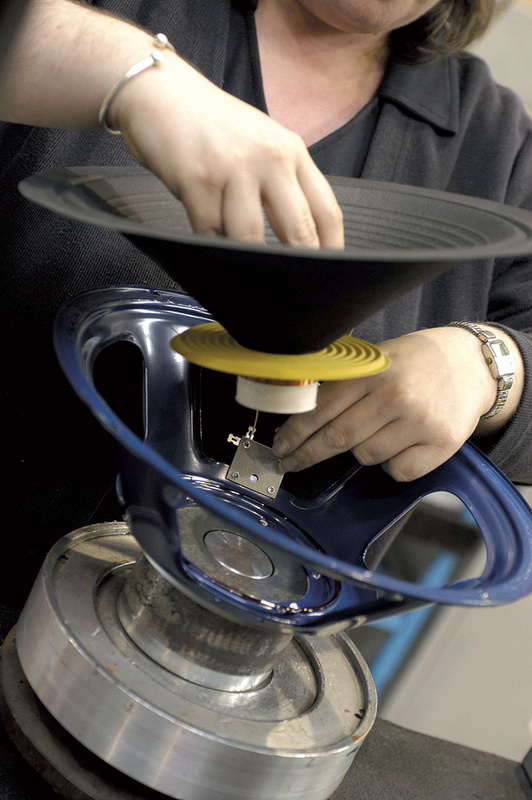 A loudspeaker is born in the Celestion factory. Here, the cone assembly is being constructed. Yet in the centre of this little scene there is one crucial factor that is often completely overlooked by both parties: the loudspeaker that is actually making all the noise. In practical terms, the speaker is the voice of the instrument, the source of the sound we're trying to capture. But how much do we really know about it? In this feature, we'll be finding out how the speakers found in guitar cabs and combos actually work and discovering how much influence speaker choice has on the sound of the electric guitar. Hopefully, when we understand a little more about what makes guitar speakers tick, we can put this knowledge to good use in the studio. Beyond simply looking at the theory, I want to find out what different speakers sound like in practice. To do this, I've had a rather unusual speaker cabinet built, equipped with four different drivers and a variety of input options, so I can directly compare their response when fed with the same signal. I used this cabinet to record a collection of audio examples, which can be found at https://sosm.ag/recording-amps-2012-media and are described in the 'Hear For Yourself' box. 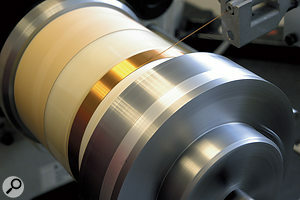 A voice coil being wound. On the face of it, the speaker in a guitar amp operates just like any other dynamic loudspeaker. The speaker cone is attached to a cylindrical coil of wire — the 'voice coil' — which sits in a narrow gap surrounded by a permanent magnet. When an electrical current passes through this coil, it becomes an electromagnet and, depending on the direction of the current, is attracted to or repelled by the permanent magnet. This moves the speaker cone back and forth, which in turn moves the air in front of it, creating sound waves. It's this simple principle that lets us turn the alternating current originally generated in the guitar's magnetic pickups back into something we can hear. However, the speaker's role in the resulting guitar tone is much more fundamental than merely being the last stage in the process of making that original signal much, much louder. Try comparing the signal from an electric guitar amp's direct output with the sound coming from its speaker. It's a bit like comparing the output of an acoustic guitar's pickup with the sound of it miked up: the same basic information is there, but the depth, detail and character are missing from the direct signal. If this seems a rather obvious point, ask yourself why the electric guitar signal sounds better through the amp's speaker than the speakers in your headphones or studio monitors, even though the latter are technically superior. As we are about to discover, while the basic operating principles might be the same, there is one crucial difference that sets guitar speakers apart from almost every other variety. The speakers in your headphones, hi-fi system, studio monitors or PA rig are designed to be as free as possible from distortion and tonal coloration, but in the case of a guitar speaker, these things are not just tolerated but actively encouraged. Just as the amplifier shapes, drives, compresses and colours the signal from the guitar, the speaker stamps its own indispensable personality on the sound. Given that, in a recording context, distortion is usually the sworn enemy, this concept might seem quite alien, but what we're talking about here is not the nasty-sounding distortion you get from a fuzzbox or an overloaded channel. As Ian explains, it is the non-linear break-up of a guitar speaker and the complex modes and overtones this creates that give it its characteristic tone. A completed speaker receives its edge treatment. When designing a speaker, achieving the desired tone is a matter of encouraging the distortion modes that you want and suppressing those that you don't. Given the complex resonant behaviour of the speaker, combined with the fact that the guitar signal itself is full of harmonics and overtones, this is a tricky business. According to Ian, the usual measurements of speaker performance are only of so much use. "With hi-fi and pro PA speakers, we can develop finite element models and see on a screen what they're going to be doing,” Ian says. "But that's almost impossible with guitar speakers because they're so non-linear. It's difficult enough to predict how a guitar speaker is going to sound when you're feeding it a clean guitar signal, but it's the distorted stuff that really gets the cone modes going. It doesn't need to be that loud to do that — just the complexity of the signal really gets the tone humming. The measured frequency response of all four speakers used in our test appears very similar on paper: but, as Celestion's Ian White points out, these charts do not tell the complete story! So what are the key factors in the design of a speaker that dictate how it will sound? 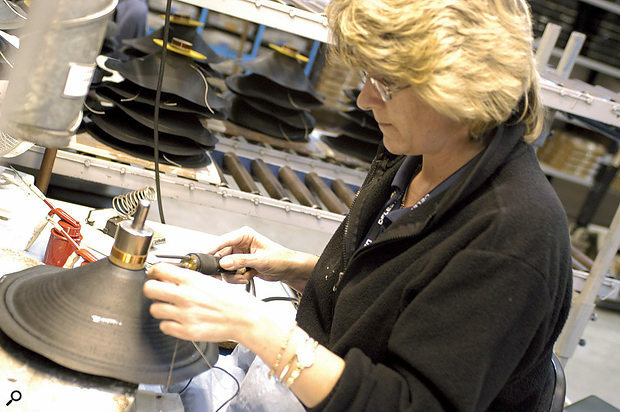 While the design of the speaker cone — which must be light in weight, yet stiff — is crucial to the performance of the speaker, this is far from the only factor in play. "The cone is the ultimate principal radiator of the sound, and we can shape that sound to some extent by playing with things like the consistency of the pulp the paper is made from, the length of the fibres and what substances the cone is impregnated with,” says Ian. 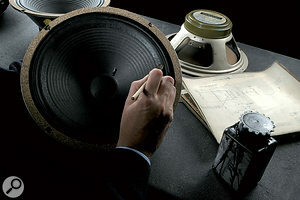 "But it's important to remember that the cone is part of an assembly containing the surround element, voice coil, dust cap and rear suspension, which all have an effect on the cone break-up modes. Trying to isolate how individual elements of a speaker influence the sound would seem to be impossible, as all these factors are interactive. Change the diameter of the voice coil, for example, and you must also change the design of the magnet, cone, dust cap, surround and suspension. You will also have changed the mass of the whole assembly, which on its own will have big implications for the break-up modes. Amid all this discussion of frequency content, resonance and break-up modes, there's one crucial factor we have not mentioned: volume level. In the world of valve-powered guitar amplification, many players become obsessed with finding their amp's 'sweet spot', the operating range within which the amp's preamp and power-amp stages are providing just the right amounts of compression and distortion for the optimum tone. I've heard many guitarists discussing speakers in similar terms, the suggestion being that, like valve amps, speakers sound best when they're really "cooking”. Some players will specifically swap out their speakers for replacements with a lower power rating in an effort to encourage "speaker break-up” or "speaker distortion”. But, as we've just discovered, break-up and distortion are very much the guitar speaker's stock-in-trade. So how much does signal level actually influence the tone and behaviour of the speaker? According to Ian, the effects of driving the speaker close to its limits are mostly undesirable. You may have encountered terms like "cone cry” and "edge yowl”. The noises they so eloquently describe are the result of the cone essentially being driven so hard that it can no longer be adequately restrained by the speaker's internal damping and suspension system. Resonating out of control, it starts producing unpleasant harmonics and overtones that are often unrelated to the actual note being played. So the reason why a 30 Watt speaker in a 30 Watt combo will generally produce a more tonally complex sound than a 100 Watt speaker is not so much to do with speaker distortion "sweet spots” as it is a product of each speaker's construction. The lower-powered speaker does not need to be as sturdy and rigid, so is free to resonate its flimsy little heart out. So if a guitarist insists that his combo only sounds good when it's turned up loud, he may well be right, but it will most likely be on account of the amp and not the speaker. The picture we're getting of guitar speaker behaviour is a fascinating one. As well as influencing volume and dynamics and dictating the range of frequencies reproduced, the speaker's complex pattern of break-up modes actively colours the sound. Tonal character and performance vary widely from speaker to speaker. Add in the individual sonic signature of the guitar signal and the way this interacts with the speaker modes, and you have a lot of fertile ground for experimentation. These revelations would seem to have particular significance for the positioning of close mics. As anyone who has ever experimented with close-miking a guitar cab can confirm, very small changes in the position and angle of the microphone can make a big difference in sound. We now have a new take on why this is the case. "If the speaker were operating in a linear, pistonic fashion, the exact position of a close mic wouldn't really matter, because a coherent wave would be coming out at all frequencies,” Ian White explains. "But as I've said, the guitar speaker is far from pistonic. At a few kHz you've literally got sections of cone about an inch in diameter each doing their own thing. While the human ear will smear this "mess” into a coherent whole, the narrow focus of a single close mic means that it will struggle to capture the full picture. That's not to say there's anything wrong with using just one close mic — indeed, there are many advantages in terms of rejecting other sound sources in the room and avoiding potential phase problems — but it's important to be aware that you'll only pick up part of the speaker's repertoire. 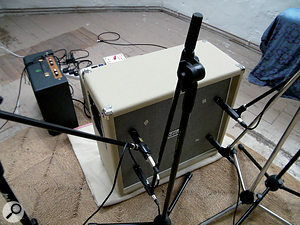 To get a more complete picture, some engineers favour placing a single mic a foot or more away from the grille, while others favour multi-mic techniques, combining close and distant mics or pairs of close mics on- and off-axis. This is certainly borne out by the audio examples recorded using the four-speaker cabinet I mentioned at the start of this article. It was built by Paul Gough, whose company Zilla Music specialise in making speaker cabinets to order. No stranger to this kind of unusual request — he recently built a custom recording cabinet for Skunk Anansie guitarist Ace, featuring four different 12-inch speakers plus a fifth 10-inch speaker — he was able to devise a wiring scheme that allowed independent use of each speaker, all four together or two pairs. I've chosen four Celestion drivers for my cab, but there are obviously plenty of other speaker manufacturers, such as Fane in the UK and Eminence in the US. Although most offer a wide range of models designed for different playing styles and power requirements, some are closely associated with certain sounds: EV specialise in loud, clean, broad-bandwidth drivers, for example, while the US-made Weber speakers and the modern-day Jensen reissues made in Italy focus on recreating the sound of '50s and '60s guitar speakers. There is also a considerable number of small 'boutique' manufacturers offering handmade specialist speakers, so there's a lot to choose from when looking to expand your palette of sounds. The four different 10-inch Celestion drivers the cabinet is equipped with are the G10 Vintage, the G10 Greenback, the G10N-40 and the G10 Gold. Aside from the fact that the last of these uses an Alnico rather than a ceramic magnet, in terms of their "basic geometry”, as Ian White puts it, these four speakers are very similar, sharing a 10-inch cone diameter and 1.75-inch voice coil. As you might expect, their specifications in terms of frequency range, sensitivity and power handling are also very much alike. If I'd really wanted to make the widest possible range of sounds available in one "ultimate recording cab”, I could certainly have gone further, incorporating eight-, 12- or 15-inch speakers with radically different specs. There are a couple of good reasons why I didn't. 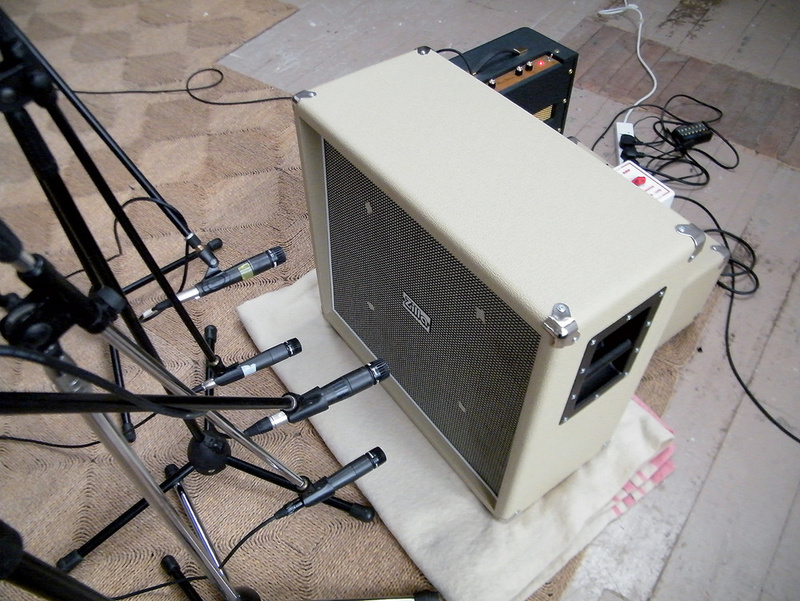 For one thing, I wanted this cab to work not just as four individual speakers in a box, but as an actual 4x10. If any one speaker was much louder than the rest, that speaker would completely dominate the overall sound. But mainly, discovering that an eight-inch Alnico speaker rated at 15 Watts sounds different to a 12-inch, 100 Watt, ceramic-magnet speaker would not constitute much of a surprise! It seems a much more worthwhile exercise to find out how big a difference in sound there is among of group of ostensibly similar speakers. As it turns out, the difference is considerable. Even to the naked ear, plugging into each speaker in turn reveals distinct variations in terms of volume and tonal character. When they're miked up, the differences in the way each speaker handles the bass, mid-range and treble are even more marked. The G10 Vintage is loud, full and bright, with the familiar lift in the upper mid-range that, as with its bigger brother, the 12-inch Vintage 30, helps it to cut through the mix. The Greenback has a slightly warmer sound, with a more pronounced high-frequency roll-off. The G10N-40 is similar in some respects, but with the mid-range emphasis shifted lower, creating a somewhat darker sound. The Alnico-magnet G10 Gold, meanwhile, is bright and open-sounding. In a studio context, this 4x10 cab really shows just how fundamental the contribution of the speaker is to the sound of the electric guitar and how much can be gained by exploiting this. Beyond the fact that the individual character of each speaker can be used to shape the sound at source, a multi-mic setup opens up a huge range of tonal options. Some really satisfying and well-rounded sounds can be achieved by combining individual close-miked speakers with a room mic or mixing the sound from two or more different speakers together. Although financial and space constraints are obviously a factor, if you're serious about electric guitar recording you should give some thought to how you're using the speakers you have at your disposal, and whether the addition of an extra cab to your studio, equipped with one or two very different speakers, might expand your options. I asked Celestion's Development Director Ian White to explain the specifications typically listed by speaker manufacturers and what they mean in terms of sound. Magnet type: Guitar speakers typically use ceramic, Alnico or neodymium magnets, with ceramic magnets being the most widely used. Ian says: "It's difficult to consider the three magnet types in isolation, because they each require a significantly different magnet-structure topology to be efficient magnetic assemblies. These different physical arrangements cause their own tonal differences due to motor inductance variation and eddy-current behaviour. So there are more things in play than just the magnet composition itself. Speaker diameter: Though four-, six- and eight-inch drivers are available, most guitar combos and speaker cabinets house 12-, 10- or sometimes 15-inch speakers. Ian says: "The 12-inch driver has effectively become the industry standard, setting the basic bandwidth and break-up characteristics we now expect from a guitar speaker. Once the 12-inch format was established, guitar pickups, amplifiers and other associated electronics were naturally optimised around this size of driver, cementing its dominance — it's the most common size of speaker in use today, by some distance. Power: Given in Watts, the power rating indicates the maximum amplifier power the speaker can safely handle. Ian says: "The power rating and resultant tone are linked. Most of the things we do as design engineers to increase the power handling of a guitar speaker can, without care, result in a less tonally complex sound. A more robust design that can cope with more power normally requires components with increased mass and stiffness. This, together with changes to the internal damping, tend to discourage the desirable break-up modes from being excited in the cone. Sensitivity or SPL: Typically stated in dB for 1 Watt of power measured at 1 metre, the sensitivity figure rates the overall efficiency of the speaker. Ian says: "The parameters that affect sensitivity, for a given size of speaker, are mass and motor strength. Increasing the mass of the moving assembly — the cone, coil, suspensions and so on — results in a reduction in sensitivity, while increasing the motor strength elevates sensitivity. There are tonal reasons for keeping the moving mass low, so in general sensitivity is mainly controlled by motor strength. The 'motor' in question is the voice coil and magnet assembly, and its strength is usually defined by the 'BL' factor, where 'B' is the magnetic flux density achieved in the voice-coil gap and 'L' is the length of the wire in the coil that is active in the gap. 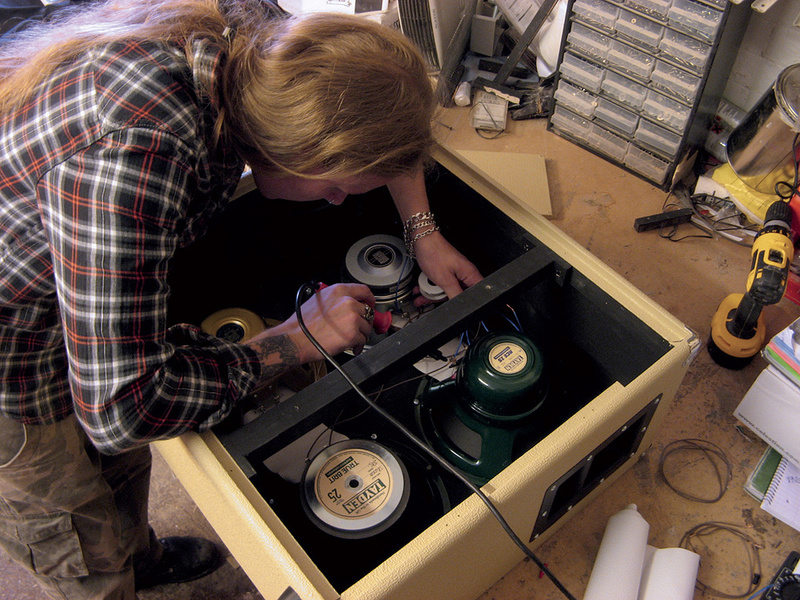 Paul Gough of Zilla assembles the special 4x10 cabinet described in this feature. The Tayden speaker visible in the photo unfortunately turned out to be defective, hence the eventual all-Celestion lineup. As well as the speakers themselves, the cabinet that houses the speaker(s) also has a significant influence on the sound. When not accommodating bizarre custom orders like mine, Paul Gough of Zilla Music (www.zillacabs.com) offers a variety of more standard cabinets ranging from the light, compact and portable to the heavy-duty and oversized. So what difference do the cab's dimensions make to its sound? However, this is not just a question of size. The density, thickness and rigidity of the woods that make up the cabinet's back, sides and baffle — the front panel on which the speakers are mounted — all exert an influence. As with speaker design, it seems that the cab builder must balance a number of interacting factors to achieve the desired sound. The construction of the baffle has probably the largest individual effect on how the speakers perform. A more rigid baffle will hold the speaker more firmly in place, generally giving you more punch and projection, but a less rigid baffle is not necessarily a bad thing. Assuming the cab is properly constructed from the right materials, allowing it to resonate and colour the sound can produce a more characterful and lively tone. "You can always make the baffle more rigid by making it thicker or bracing it more securely,” says Paul, "and you can always lessen the effect by using a thinner baffle, or by not securing it so strongly, like old Fender 'tweed' amps, which effectively just had four nuts and bolts holding the baffle on. A common feature on Zilla cabinets is a removable rear panel, allowing for both open-backed and closed-backed operation. "A closed back tends to help with the bass response,” Paul explains. "Because the air that's trapped inside the cabinet is pushing back against the speakers, the speaker damping doesn't come into play as much. The response will change in other, more subtle ways, but the most marked difference will be a tighter low end and, often, subjectively less treble. "Opening up the back helps a cab to 'fill the room'. You may lose a little bit of your bottom end and lower mid-range, but in most cabs that's not really a problem — you can just dial it back in on your amp if you want it. The sound will be a little less intense: it's what you'd explain as a 'nicer' sound. It's a bit more chilled-out. If you're playing death metal with lots of chugging low riffs, you'd use a closed back, but if you're just after a nice open guitar sound, an open-backed cab is something to consider. The four miking configurations used to record our audio examples.The most commonly used microphone for recording electric guitar amps is undoubtedly the Shure SM57, so in order to see how the speakers in David's unique 4x10 cabinet would differ, we decided to use four SM57s in a variety of close-miked arrangements repeated as closely as possible across the four speakers. 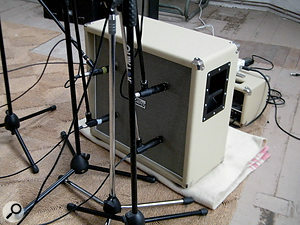 The design of the cabinet makes it possible to connect the speakers individually, in pairs or all at once; had we been using a transistor amp, we could perhaps have used a re-amping device to record each speaker in turn, which would have made the differences more obvious because of the lack of spill. However, we didn't want to be constantly powering valve amps on and off in order to switch speakers, so we opted to have David playing guitar 'live' and record the output from each speaker simultaneously. To place the results into context, and pick up the sound of the cab as a whole, I also put up a Bang & Olufsen BM5 stereo ribbon as a room mic, about eight feet away. Bearing in mind that the SM57 isn't the most neutral of microphones, we planned to repeat some of the tests using four AKG D224Es (a long-discontinued but very high-quality dynamic mic that has minimal proximity effect and a relatively uncoloured sound), but the rigours of close-miking a loud amp proved too much for one of them, and it lost its high-frequency element. 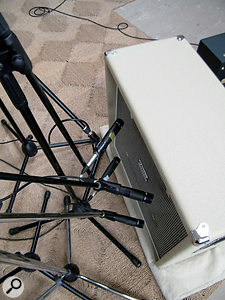 All mics were recorded through a Focusrite ISA828 preamp, feeding the line inputs on a Steinberg UR824 audio interface. We recorded short examples in different musical styles, mainly using an American Standard Fender Stratocaster fitted with Bare Knuckle Apache vintage-style pickups and an Eastwood Airline reissue with Iron Gear Blues Engine "PAF-style” pickups and retrofitted Bigsby vibrato, through David's Dr Z Maz 18 Jr and Cornell Plexi 7 amps, for clean and dirty sounds respectively. No effects were used, and the amp controls were carefully reset so that the Strat and Airline sounds were repeatable. An inch from the grille cloth, at a 45-degree angle pointing outwards just past the centre of the cone.